(NaturalNews) Mainstream media's attention in America to the Ebola crisis in West Africa has long since wandered off, but that doesn't make the crisis any less real for the people living there. As of December 7, the U.S. Centers for Disease Control (CDC) is tracking a total of 17,908 cases of Ebola in Guinea, Liberia and Sierra Leone. 6,373 people have died from contracting the virus, according to the report. Other countries affected by the spread of Ebola include Mali, Nigeria, Senegal, Spain and the United States, though the outbreaks in these nations are minimal in comparison. 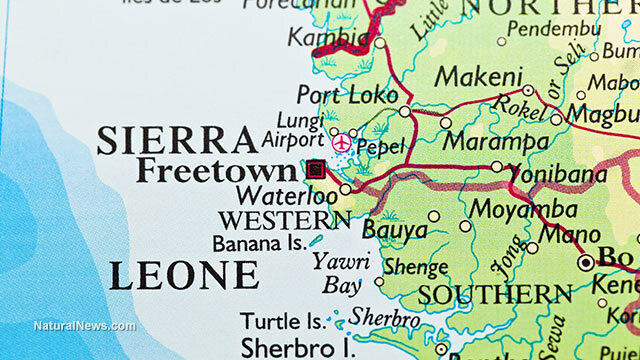 Sierra Leone currently has 7,897 cases, and 1,768 people have died there. The CDC's Ebola treatment web page states that currently "no FDA-approved vaccine or medicine (e.g., antiviral drug) is available for Ebola." That is to say, no cure has been found in conventional, corporate medicine. The CDC's best answer is to hope that the virus is detected early, then provide intravenous fluids and electrolyte salts, maintain oxygen levels and blood pressure, and treat other infections when they occur. In layman's terms, keep them watered, fed and comfortable and hope for the best. The situation in West Africa, and especially Sierra Leone, is getting worse. According to a recent report, the eastern district of Kano has been put on a two-week lockdown due to a surge of infections discovered by healthcare workers there. The report, published by Al Jazeera and citing the World Health Organization (WHO), also states that Sierra Leone has now surpassed Liberia as the country most affected by the deadly virus. "[T]he WHO said on Wednesday that it had found bodies piled up at the only hospital in Kono, a district of about 350,000 people bordering Guinea," according to the report. With a scenario this bleak, it would seem that any possible solution to the 2014 Ebola outbreak would be under consideration by health authorities in these countries, the WHO, the CDC and other relevant medical authorities. But that is not the case. Dr. Robert Rowen, MD, recently received word from Sierra Leone on November 27 that an Ebola virus treatment he was involved in developing was being used to treat Dr. Komba Songu M'Briwa, a Sierra Leone military doctor, confirmed by testing to have the Ebola virus, who has been helping Ebola victims in his country. Dr. Rowen received the report from Dr. M.I. Jalloh who stated in an e-mail that "He is presently stable with no diarrhea or vomiting." That's right, Dr. M'Briwa no longer has the Ebola virus, according to Dr. Jalloh. Dr. Rowen was so happy, he "felt more than jubilant. Like jumping out of my skin!" The treatment was supervised by Dr. Jalloh and administered by Dr. Kanneh. According to Dr. Jalloh, Dr. M'briwa received ozone (55 ml) twice a day, as well as "Advance Cellular Silver, Vitamin C and Glutathione. " Dr. Jalloh and Dr. Kanneh are two of the many healthcare professionals in Sierra Leone that Dr. Rowen and his partner in the development of this treatment, Dr. Howard Robins, trained in the procedure. The treatment, named the Rowen-Robins Ebola protocol by the two physicians, involves the use of ozone therapy. Both doctors have decades of experience using ozone therapy to treat a number of different ailments. The treatment method for African Ebola patients which Dr. Rowen and Dr. Robins taught uses direct intravenous oxygen gas, which is 99 percent oxygen (O2) and one percent ozone (O3). "You start slow with 20cc. [Dr. Robin] works up to a maximum of 120cc of gas. He gradually increases the concentration. Initially, in the early stages of this treatment, you can get a cough and some chest tightness, which eventually with further treatments modulates and goes away. It doesn't seem to be a big problem... [but] can be a little uncomfortable, because it takes about five to 10 minutes for it to go away," explained Dr. Rowen to Mercola.com. He also stated that it was "extraordinarily effective" and "dirt cheap to do." The doctors paid their own way to Africa and received donations from family, friends and other good Samaritans so that HAZMAT suits, IV needles, syringes, gloves and other supplies could be brought along on the trip. Most importantly, they received a donation of 10 machines from Longevity Resources, a Canadian manufacturer of Ozone Generators, used for a variety of medical and research applications. They arrived in Africa on October 18 with a lot to do and a limited amount of time to do it. Dr. Rowen and Dr. Robins each delivered a lecture to West African physicians that explained the process each uses, the process they developed specific to Ebola, and the medical research regarding ozone therapy. The next day, the equipment arrived and hands-on training was conducted. Dr. Rowen set the example, being the first "patient." The doctors witnessed him receiving 65 cc of the ozone therapy. They then watched and learned as each of them received a 20 cc therapy. After training 30 doctors and other healthcare workers the first day, another 20 were trained the second day. But the day got much more interesting. Dr. Rowen explained, "At 12:30 pm, our training was interrupted in order to visit with the President of the country. It seems some ministers were wanting our Ebola treatment project to proceed 300 miles from the capital, Freetown." The doctors, with a lot of help from their host, Dr. Kojo Carew, explained to the President that this was not a good use of the resources they had brought with them. The President agreed and went to meet with the ministers to correct the situation. Before departing, the President invited them to meet with him at his personal residence that evening. "We... met with him for 90 minutes. He appeared to be a very intelligent, concerned man, looking out for his people. His first concern was protection for those bravest of souls in the front lines," said Dr. Rowen. "Believe it or not, this open-minded leader became the first chief executive of any country (that we know of) to ask for and receive an ozone treatment," he added. A few days later, they returned home. Will ozone therapy be given a chance in West Africa? Ozone therapy can be legally performed in 14 states, including California, New York and Texas, and thousands of people have found relief from a variety of ailments using ozone therapy, yet the U.S. Food and Drug Administration (FDA), the CDC, the WHO and other conventional medical practitioners are unwilling to try ozone therapy in a region of the world where the situation grows more desperate every day. Could it be because it would bring into question the validity of the conventional medical process? Maybe. Or perhaps it's because of the enormous influence that Big Pharma wields over the medical community? The question the conventional medical community must ask: How many lives should be lost before an alternative medicine therapy is given a chance to save lives and prove itself to the medical community at large?